Bolton Car Detailing- Wash Me Now. Of all Caledon’s fine communities, Bolton is by far the busiest and most populous. Just 50km from Toronto, this abundant town is known for its historic downtown area and the Humber River that flows through it. Bolton has almost 9,000 households and the significant amount of traffic in this area makes the local highways particularly convenient. Since daily driving is essential for just about everyone in Bolton, it’s easy to how cars can pack on the dirt. The longer they are left to accumulate dirt and dust, the greater the risk of irreparable damage. For example, whether the roads are dry and relatively clean or wet and muddy, sand and dirt particles have a way of attaching themselves to your car. As they become more and more embedded, they are tougher to remove, and regular washing usually results in even more damage like surface scratches. The good news is that professional mobile Bolton car detailing by Wash Me Now will take care of all your vehicle cleaning needs without the hassle of having to drive to us! We will come to you anywhere in Bolton and work our detailing magic that will transform your car! While some drivers use their vehicles on a daily basis, others only need to start that engine every other day. Regardless of how often you drive your car, dirt will always find a way of sneaking inside. Even in the best cases, if the dirt can’t get it, it will certainly stick around on the exterior and ruin your perfect paint finish! At Wash Me Now, we understand just how busy Bolton residents are. Rushing off to get the kids to school before hurrying along to work and then racing to pick the kids up only to find a bucket list of household chores waiting for your attention. Even without kids, life is busy, and those who are particularly career driven know just how many extra hours are required to get ahead in any industry. 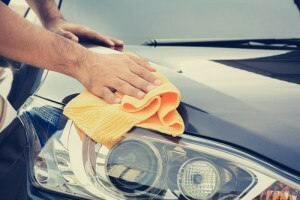 With so much to think about and take care of every day, who has time to wash their car? We do! 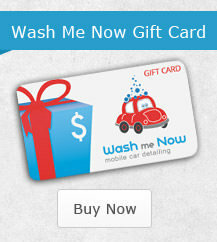 Our team at Wash Me Now knows just how to make car detailing easy and fast. Not only do we come to you but we also bring all of our own supplies (including our own water). We are highly experienced in working on a wide variety of vehicles from sedans and SUVs to luxury vehicles and everything in between. We even have experience detailing electric cars which are particularly specialized considering the substantial differences between these cars and those that run on regular fuel types. Our team takes detailing extremely seriously, and we treat each and every client as an individual with individual needs. Our team is fully mobile which means that you don’t need to drive to us – we will come to you anywhere in Bolton. 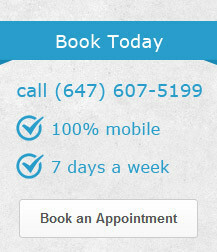 When making your appointment, simply provide us with your address and we will bring everything including our own water! With more than 100 5-star reviews from satisfied customers, it’s easy to see why our clients return time and time again! We encourage our future customers to take a look at our reviews to find out what others have to say about our services and team. The forests in this area and those along the Humber Valley are a magnificent sight to behold. These natural spaces along with various recreational areas are an important part of Bolton and maintaining an equilibrium with nature. With this in mind, our team has selected the safest cleaning solutions, and we also use steam to reduce the amount of water used to detail each car. At Wash Me Now, you can keep your car in top condition without compromising your beautiful surroundings. At Wash Me Now, we understand the financial pressures that every household endures. Often, it’s our financial obligations that force us to neglect such matters as professional auto care. By taking proper care of the aesthetic appearance of your vehicle, you will help it maintain a higher value. In other words, car detailing really is an investment. In order to make this investment accessible to all, we offer a wide variety of packages. 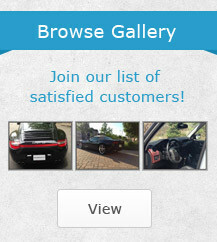 Of which, we have found that our Showroom Detailing package has been the most popular of all. Not only is this package extremely affordable, but we also tend to the interior and exterior of your vehicle within 2 hours (additional time required for larger vehicles). Steam has a number of household, commercial, and even industrial uses. Not only is steam great for killing germs but it will do so without the use of harsh chemicals. For most germs, extreme heat is their biggest enemy which makes steam highly effective. 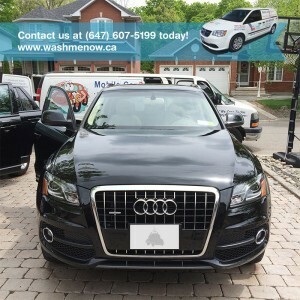 Another reason for using steam cleaning at Wash Me Now is to reduce the amount of water used to detail each vehicle. Saving water is always good news for the environment! Some of our Bolton auto detailing packages focus on the interior of your vehicle, while others tend to the exterior. We also have packages that tend to the interior and exterior as well as optional extras such as clay-bar treatments, exterior plastic restoration, and pet hair removal. This makes it possible for vehicle owners to choose a detailing option that suits their needs and their budget. For most of us, our days and even our weekends are all planned ahead of time. We know when we need to leave home in order to get to work on time, we know when we intend on doing grocery shopping, and so on. Since time plays such a significant role in our lives, Wash Me Now packages each includes a time estimate. This means that you will know when your vehicle will be ready and you can plan your day accordingly! With all of our experience, great prices, and mobile services, it’s no wonder we are so highly rated in the Greater Toronto Area! Contact our team today at (647) 607-5199 to book your professional Bolton detailing!